The following death notices were received on Tuesday. Bessie Edwards of Bedford passed away Monday morning, May 24th at Garden Villa at the age of 91. Born in 1918 in Lawrence County to Noble and Florie Hubbard, she had worked at Greystone Hotel as a waitress and was married to Oscar Wesley since 1939. Bessie was also a operator for South West Envelope Co. and was a member of the Englewood Baptist Church. She is survived by two sons, Arthur Edwards and Thomas Edwards; one daughter, Vicki Baird; one brother Carl Hubbard; as well as several grandchildren. She was preceded in death by her parents; her husband; five brothers, Elbert, Noble, Winfred, Paul and Jim Hubbard; as well as two sisters, Frances and Helen. Funeral services will be held on Friday afternoon, May 28th in the Elmwood Chapel of Day & Carter Mortuary with burial to follow in Beech Grove Cemetery. 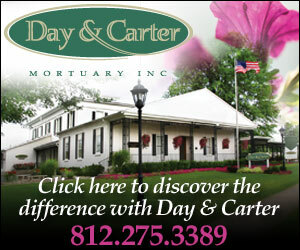 Visitation will be from 11:00AM until the hour of service on Friday, May 28th at Day & Carter Mortuary.